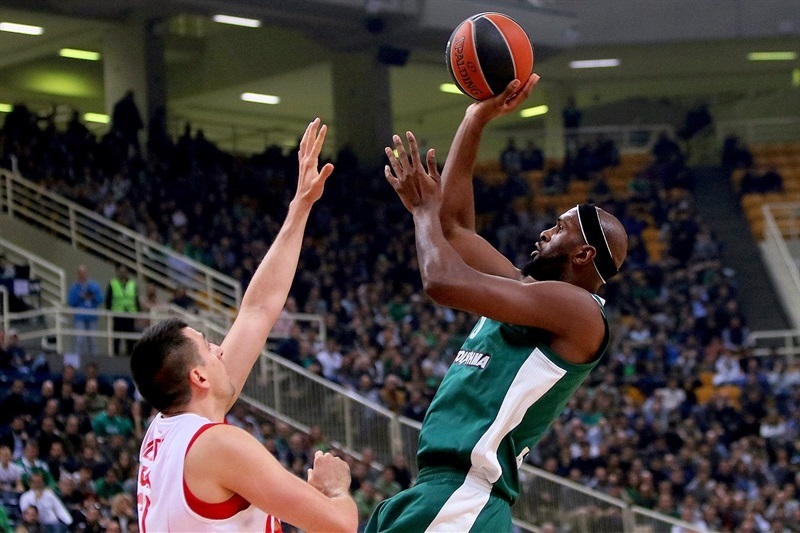 Panathinaikos Superfoods Athens led from start to finish en route to a 91-71 victory over visiting Crvena Zvezda mts Belgrade that clinched a spot in the playoffs for the Greens on Tuesday night. 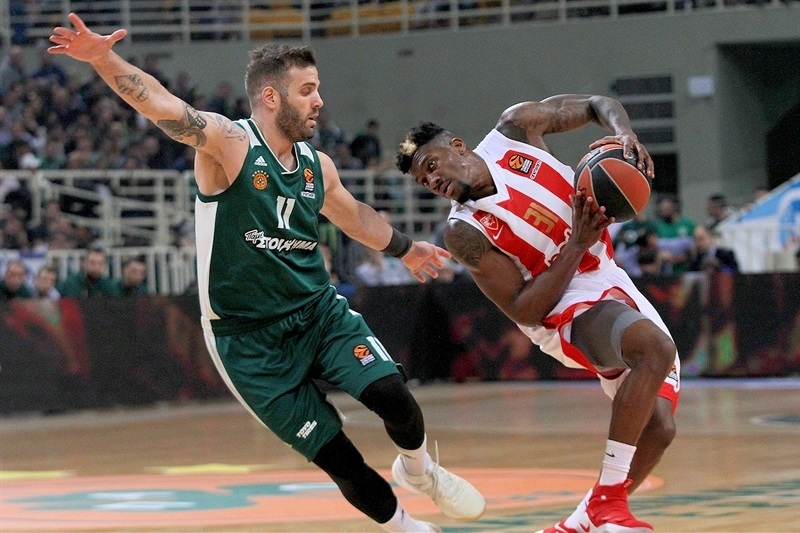 Panathinaikos improved to 16-11 in the standings, while Crvena Zvezda dropped to 11-16 and was mathematically eliminated from playoff contention. 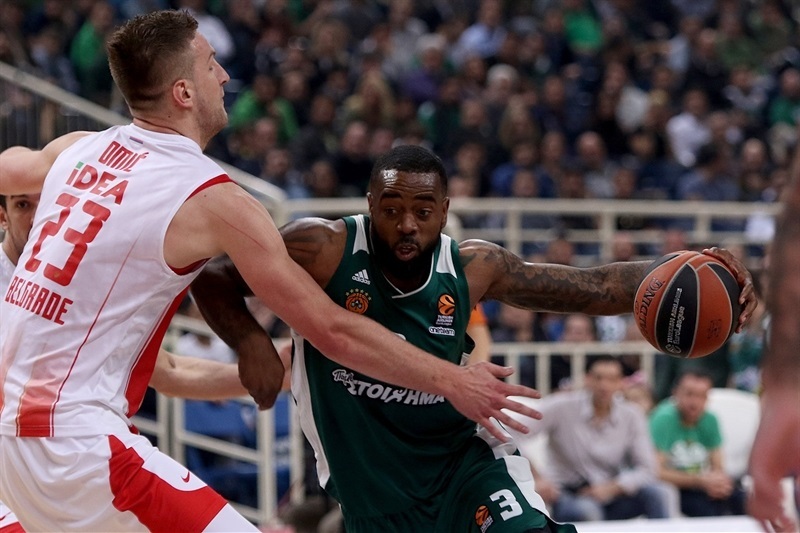 Panathinaikos opened the game with a 17-2 run to take control and then used a big start to the third quarter to pull away to a 20-point margin that broke the game open. 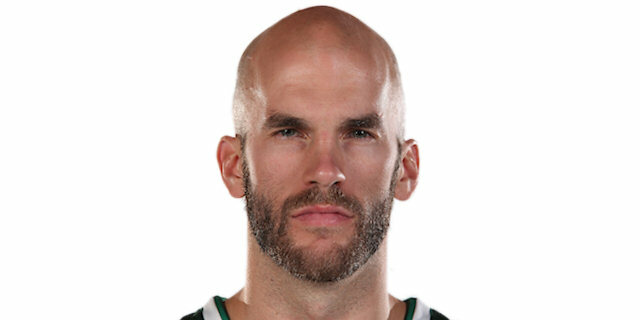 Nick Calathes starred in victory with 17 points, 10 assists, a career-high 6 steals and 5 rebounds in less than 25 minutes and without stepping foot on the floor in the fourth quarter. Chris Singleton scored 21 points on 4-for-5 three-point shooting and K.C. 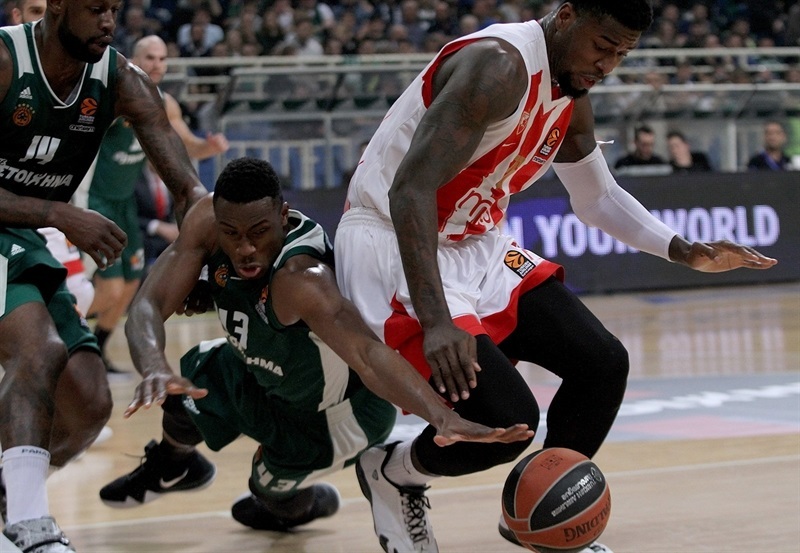 Rivers added 11 points for Panathinaikos which had each player play at least 9 minutes and score at least 2 points. Dejan Davidovac netted 17 points and Alen Omic collected 15 points and 7 rebounds for the visitors. Calathes opened the game with a three-point play and also had his first assist for a layup by Mike James. A triple from James opened a 12-2 lead after just three minutes and a three-pointer and a jumper from Singleton created a 17-2 margin. Zvezda got it going through its bench, especially Omic, whose three-point play and layup helped cut the margin to 24-15 after 10 minutes. Singleton opened the second quarter with a three, before Nikos Pappas made a runner and then fed Kenny Gabriel for an alley-oop dunk. The hosts extended the lead to 34-20, but Taylor Rochestie hit a three-pointer and James Feldeine a baseline jumper that got Zvezda within 34-27. A dunk from Matthias Lessort and a three from Davidovac cut to 36-32. 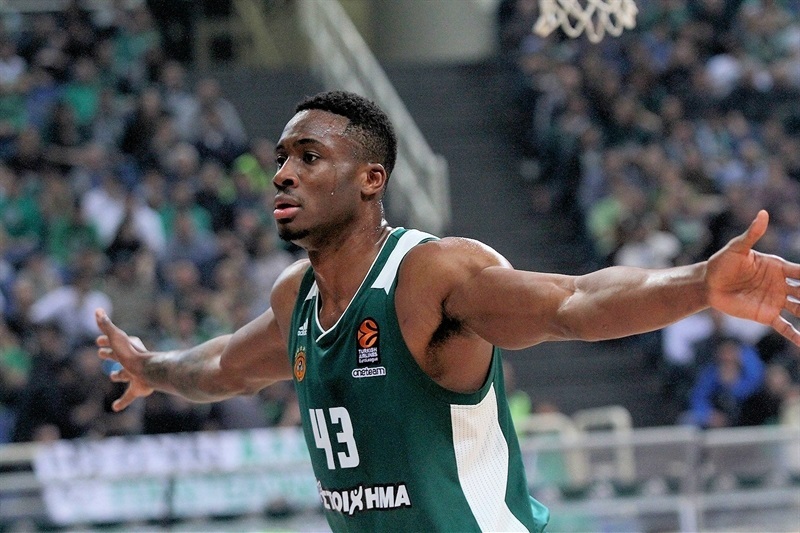 But after a timeout, Singleton hit another three, and later added a dunk, helping Panathinaikos take a 47-38 lead into halftime. 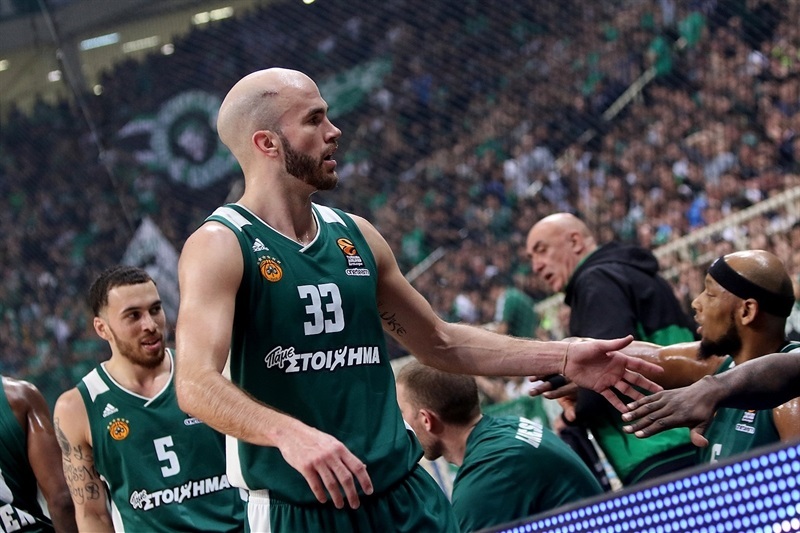 At the start of the third, Calathes scored quick 6 points as Panathinaikos opened a 57-40 lead. Feldeine hit a triple and Omic had a tip-in for Zvezda, but Singleton hit a three-pointer and James went coast-to-coast for a layup, before Calathes served Singleton for a fastbreak dunk to make it 66-47. 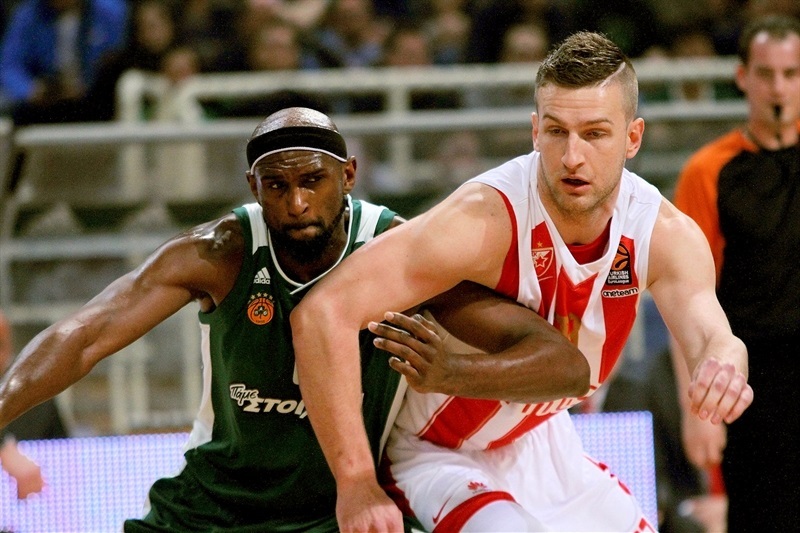 Baskets from Rivers broke the 20-point barrier and Calathes scored inside to make it 76-54 after 30 minutes. 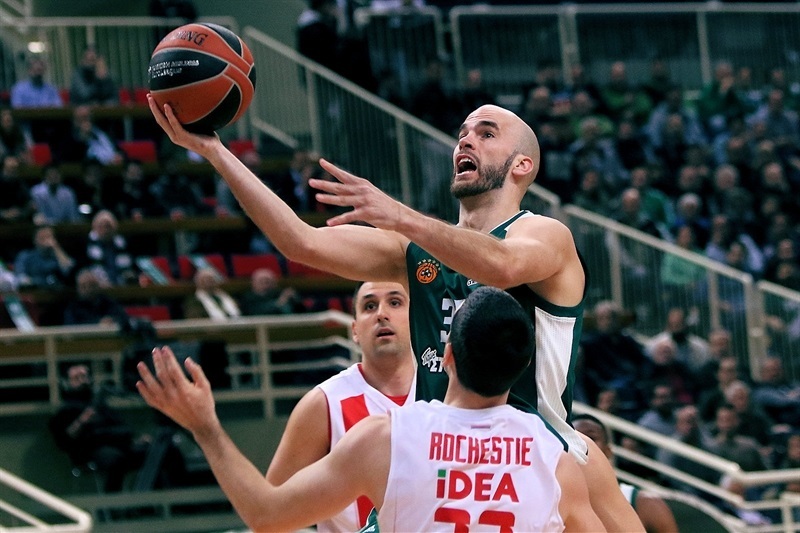 Calathes went out of the game in the final minute of the third and did not need to return as Panathinaikos was in control. In the fourth, Davidovac and Rivers traded triples before a three from Davidovac and a three-point play from Lessort helped the visitors get within 80-68. 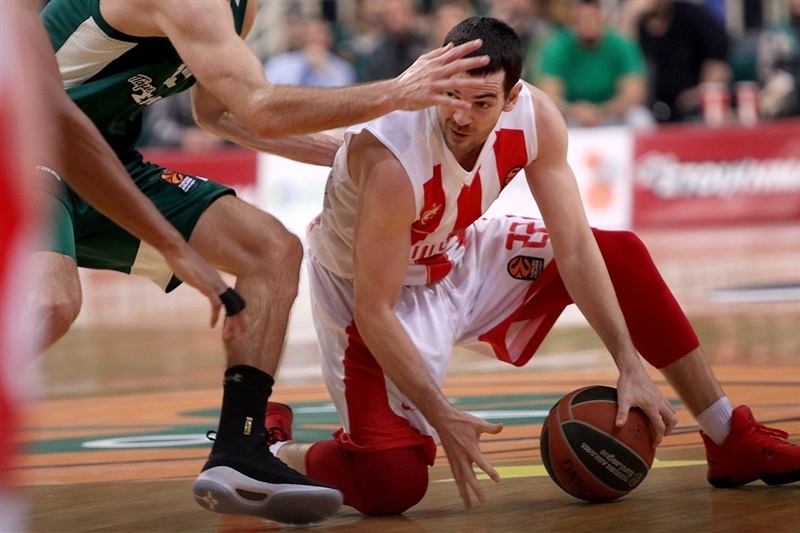 But that’s as close as Zvezda got as Pappas fueled an 11-1 run to close out the game. "First of all, we are happy for this win, especially with our fans, who could enjoy today. I think we played a good game, good basketball, attractive on offense. We ran very well in the fast break and more or less we played good defense all game long. I think we did a great job, with some mistakes, for sure, but a nice game for everybody, especially for us. We are very happy to have qualified [to the playoffs]. When the EuroLeague started and we saw the quality of all teams, being one of the best eight teams looked difficult, and we did it. Therefore, congratulations to the players and to the whole club for the job done. It is my 11th consecutive playoffs appearance and I am happy I was able to do it. Now, we have to go game by game and keep trying. 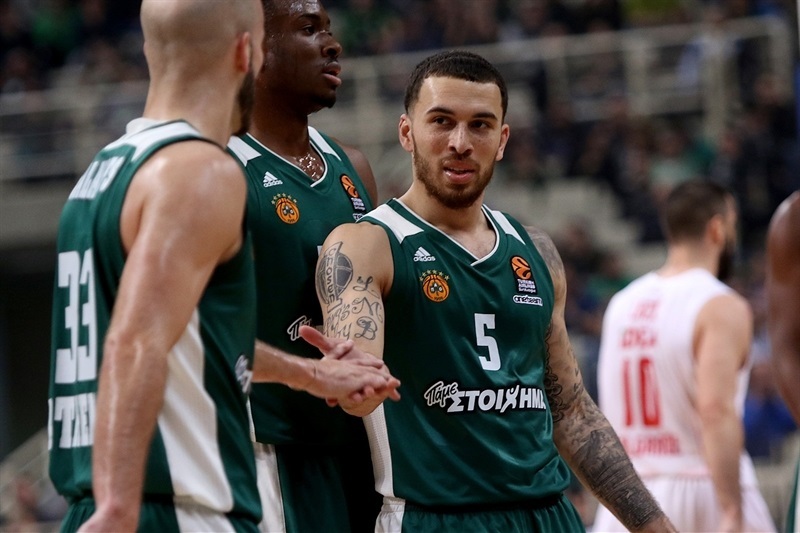 We have to carry on playing with the same mentality and play a new final in Tel Aviv in 48 hours, be ready for it, try to go game by game and see where we stand in the end… Mike James and Adreian Payne are helping us, but they need an adjustment period. We cannot make miracles. Nikos Pappas and Matt Lojeski came back after just two practices and they need time to catch the right rhythm. Therefore, we will improve little by little and reach the level we had at the beginning of January, when we were playing very well." 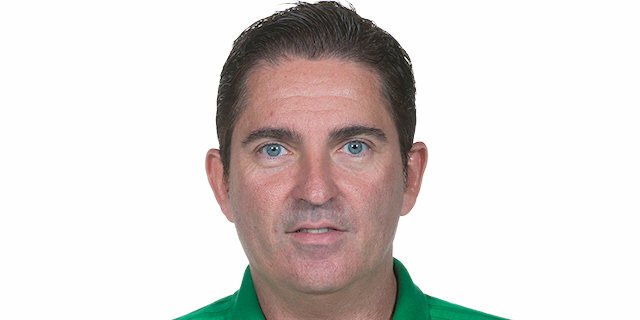 "Congratulations to Panathinaikos for this win. It is great to play in this arena, it is a great atmosphere. But I think that was the biggest problem for us, I think that affected us in the start. Except for that start of the game, and five or six minutes in the third quarter, I don’t have anything bad to say about my players. 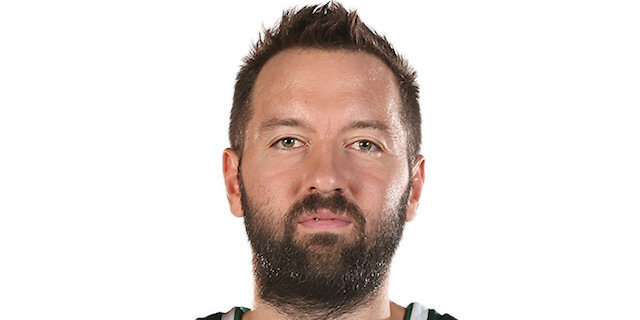 In this game you could see Panathinaikos wanted it more, probably because of trying to get a better position in the playoffs. 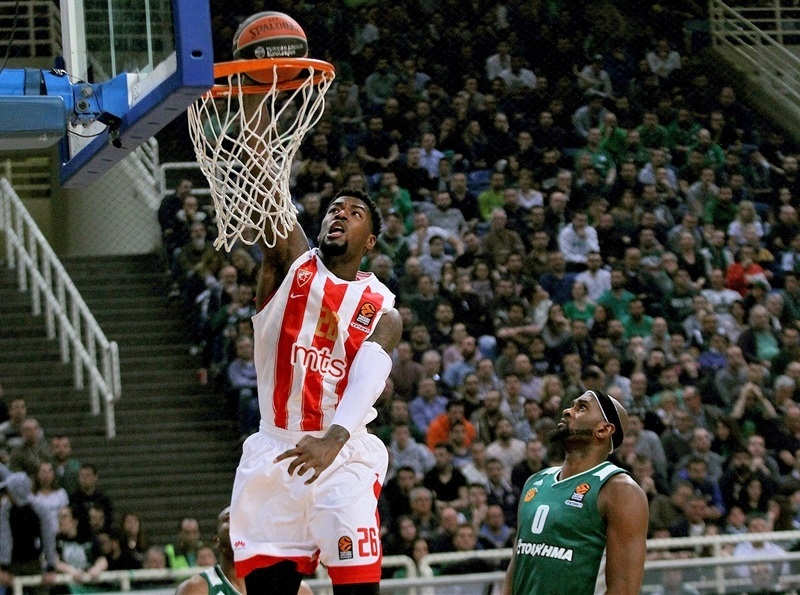 In my opinion, Panathinaikos is among four most powerful and athletic teams in the EuroLeague." "It is a big win for us. We needed to come and play well, and obviously get this home win and hopefully get a couple more in a row. I just try to help the team as best as possible, and do everything. If it has to do with steals, points, assists or rebounds, I just try the best I can to help win the game." "We are happy with this result. We knew it was an important game for us, especially as the season is winding down. We have to get the best position available for the playoffs. 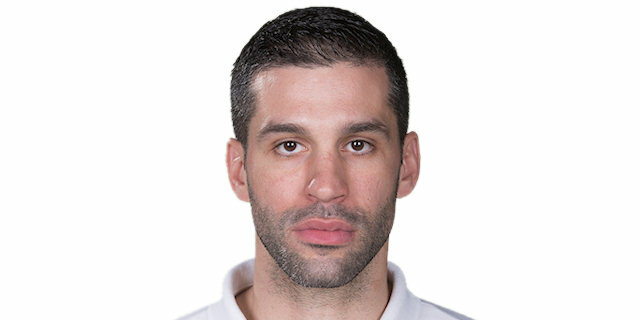 We are happy, we have a game in less than 48 hours against Maccabi, and we focus now on that."